A note from Charles. Today, January 27, is Holocaust Remembrance Day, to commemorate the six million Jewish victims and the millions of other victims of Nazism, and to honor the dwindling number of still living survivors. Often overlooked are the countless families who risked their lives hiding Jews and others in their homes. The story of the Anne Frank family, of course, is well known. Not so much the story of the ten Boom family. As I was thinking about this family this week, I remembered that one of the first articles I ever had published (25 years ago) was about this family. I dug it out and read it. I had forgotten what motivated their sacrificial love for the people they sheltered in their homes. It was the deep Christian faith that had been passed down through generations of ten Booms. I offer that overlooked part of their story here, in the original article, in the hopes that it inspires young families today. Hurtling alongside narrow canals and cutting through golden flatlands, the train from Amsterdam took twenty minutes before grinding to a halt at Haarlem. Number 19 was my destination. A three-story corner building on a small intersection once heavily patrolled by the Gestapo, it was now the most famous of all of Haarlem’s hiding places. I strolled from the station and meandered the branching, cobbled streets past sleepy cafes, chocolate concessions, and fresh smelling bakeries famous for their croissants and shortbread. The closer I got to Barteljorisstraat 19, the more impressed I was by the clean, quiet, respectable air of the town. And then a great contrast broke in on me. Not many years previously, that pleasant environment had been plunged into hell on earth. A reign of terror had been ushered in by German tanks and trucks and Nazi soldiers. Their nailed boots pounded the streets and kicked open doors as Gestapo raiders shouted ultimatums and seized the town for Hitler. During World War 2, many Dutch citizens, students, and all Jews had to go either into hiding or become secret resistance workers. As I entered Barteljorisstraat street and saw the bright red sign of number 19, marking the ten Boom family house and clock shop, it was hard to imagine that fear and chaos once reigned in this calm, respectable atmosphere. 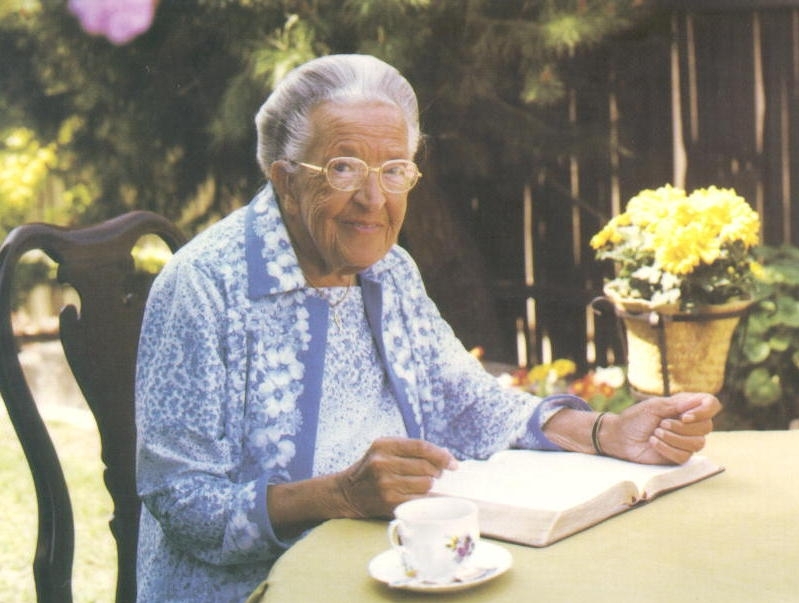 Corrie ten Boom (April 15, 1892 – April 15, 1983) was imprisoned in Ravensbruck concentration camp for sheltering Jews in her home at No. 19. After her dramatic release she traveled the world (64 countries in 32 years) speaking the gospel message. Many people know that inspiring part of her story, from her book, and the movie, The Hiding Place. Not so well known is another important part of the family’s story, which I learned in Haarlem, where I had come to meet Anthony Huijser. The founder and director of the Corrie ten Boom House Foundation, Anthony gave me a private tour of the large house and sat for a long interview, in which I learned of the ten Boom family’s deep Christian faith and commitment to serve others that stretched back generations. Without that spiritual DNA, I wondered if the family’s sacrificial activism during the Nazi occupation of Haarlem would have taken place. “In 1837,” Anthony told me, “Willem, Corrie’s grandfather, founded the clock and watch shop. In 1844, at the suggestion of a Jewish friend, he began a weekly prayer meeting every Monday evening above the clock shop to pray specifically for the peace of Jerusalem,” which, he noted to me, is a command from Psalm 122. Willem passed this prayer meeting on to his son, Casper, Corrie’s father, a Dutch watchmaker, who passed it on to his children, Corrie, Betsie, Nollie, and Willem. No doubt it would still be going on today, except…. 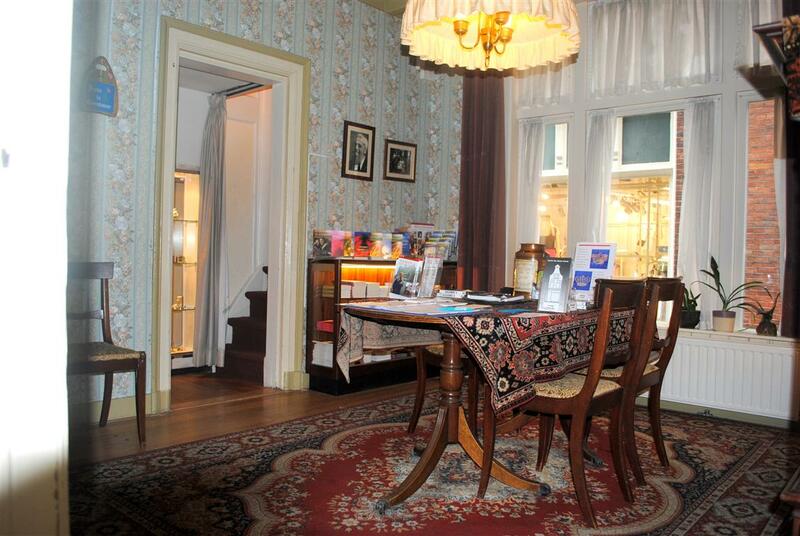 From May 1943 until February 1944, the ten Boom family opened their home to hide Dutch students, resistance workers, Jews, and even deserting German soldiers. One Monday evening in February 1944, as people were arriving for the weekly prayer meeting, the Gestapo also arrived. They stayed and arreseted all who came that evening (about 30 persons, plus the ten Booms). Except for two resistance workers and four Jews who managed to slip into hiding behind the false wall in Corrie’s bedroom, everyone was chained in pairs, packed into trucks, and delivered to jails, and later to concentration camps. The ten Boom meeting to pray for Jews had lasted exactly 100 years, the home no longer a hiding place. It had been quite natural for the family to do resistance work and to hide Jews and others. It wasn’t as if they suddenly discovered how to love that way, nor was it just the result of praying regularly for the peace of Jerusalem. Their love for the Jews and the others they sheltered arose from a broader love – to love their neighbor as themselves. This kind of love had been instilled in the ten Boom children for generations by their parents. Grandfather Willem, and after him Casper, had taught their children to be obedient to Christ in the community with an “open heart, open arms” policy toward others. Corrie’s mother, for example, when Corrie and her siblings were young, made a “blessing box” that she kept out in the home, into which the children and their friends could drop coins to help the poor and missionaries. And as her children grew, Mother ten Boom would show them how to reach the neighbors through Bible studies. Such early spiritual training led to the creation of “The Triangle Ladies.” Formed by Corrie, Betsie, and Nollie, this work, Anthony said, “was symbolized by the circle of Christ around the triangle of body, soul, and spirit, representing the whole human being controlled by Christ.” Prayer and praise “circles,” not “meetings,” arose around this concept. The idea was that if you kept your family surrounded by the “circle of Christ,” unwanted influences would remain outside. Corrie brought the young man home, saying to her father and Betsie, “We have a guest this evening. He has to hide himself.” And that was that. It was the expected thing to do for the entire family. A work for which most of the family would eventually die had begun – dare I say it – as easy as loving neighbor as one’s self. When the Gestapo arrived at No. 19 on that fateful (and faithful) Monday evening, it was as a family that they were all arrested, a family rich in generational faithfulness to God. The “circle of Christ” may have been breached by “unwanted influences,” but the love of Christ could not be deterred. 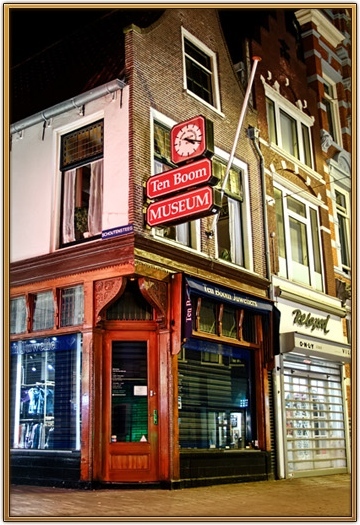 The ten Boom house and clock shop tells more than time. It is a testament about being faithful in little early on in order to be faithful in much later on. It is a lesson to never underestimate parental influence upon children. It is a memorial to the spiritual strength of Calvary that denies self for others’ sake, a love which entire Christian families may live and breathe. This article, slightly edited here, was originally published under a different title in The Christian Family (April, 1992). 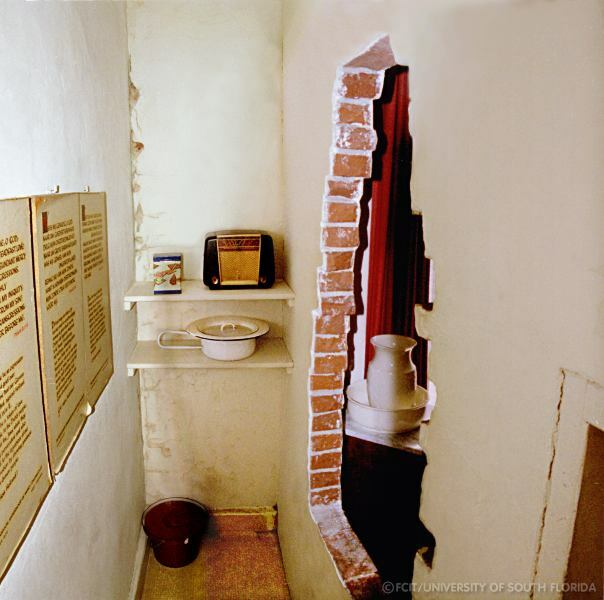 Images courtesy the Corrie ten Boom museum. A note from Charles: If you would like more of the perspectives that Waging Wisdom seeks to present, I want to invite you to follow the blog. Just click here, find the “Follow” button in the right margin, enter your email address, and click “Follow.” You will then receive a very short email notice when I post a new article. And, hey, if you like this stuff, tell a friend! Thank you. Today concludes this short 3-part series on wisdom in Scripture for the natural world, in education, and in the arts. Having looked at the first two subjects, we’ll reflect on various kinds of art in Scripture, beginning with overtly religious art. When a “people” become a “nation” – or as we say today, an “independent state” – all sorts of conditions must be met. It’s not as easy as Frank Zappa is purported to have said: all they need is a bear and an airline! Sorry, Frank. There needs to be, among other things, a territory, a government, and the ability to conduct relations with other nations. When those are in play, a new nation today usually seeks to join the United Nations – that’s big, when the UN recognizes you. Besides those essential features, another that plays a significant role is the symbolism of national identity, which may be overtly religious or not. The symbolism of the United States, for example, is not overtly religious. Its Declaration of Independence, the language of its constitution, its bald eagle, the Liberty Bell, the design of its flag, its national anthem (“The Star Spangled Banner”), and the Great Seal of the United States (E Pluribus Unum: “one from many”) do not promote allegiance to any religion. Nevertheless, all symbolically suggest values and ideas that helped forge and establish “American” national identity. This is unlike national identity rooted in religious belief. To give one example, the nation of Iran took on an overt religious identity in 1979. The Emblem of Iran, for instance, with its four crescents and a sword in the shape of a tulip, are meant to stand for the word “Allah,” and its five parts are meant to represent the five main principles of Shia religion. And the language of its 1979 constitution clearly identifies the state as an Islamic Republic. Whether it is religious or not, a nation’s founding symbolism relies on artistic skill, and in such art we can see the silhouette of a nation’s wisdom. The Bible itself underlines the importance of this in the fascinating narrative surrounding the many and varied symbols representing the religion of Yahwism, which were crafted by the ancient Hebrews during the period of the founding of the nation of Israel. This story occupies most of the second half of the book of Exodus. In particular, chapters 28, 31, 35, and 36 acknowledge the aesthetic wisdom of the artisans and craftspeople, both men and women, that created this religious art. In various places, the text explains that Yahweh had told Moses that he (Yahweh) had given the craftspeople wisdom “to make everything” according to the plans. Some of the leading artisans and craftspeople are named, and the specific tasks of all of the artists are carefully delineated according to the areas of expertise. Some Bible translations use the English word “skill” for the Hebrew word for wisdom (hakam) in these texts, to indicate the top-notch talent. The text identifies many of these men and women: artisans, builders, craftspeople, gold or silver smiths, jewelers, seamstresses, and others. The text leaves no doubt as to the religious meaning of what is under construction. It was to represent a “sanctuary” for Yahweh and a place for the people to come to with their sacrifices and to worship. Of course there are many kinds of art. And a lot of art, perhaps most art, at least in our day, is what we would call non-religious art. This is true even in Scripture, where we find various kinds of art sans overt religious meaning. I’ll close by noting just several genres briefly. Drama. Drama is meant to evoke emotions in an audience, feelings of tensions, for instance, of anticipation, of what’s going to happen, how is this going to end? A scene, the way the characters act, the language they use, their moods, and much else besides all contribute to good drama. For me, the story of King David awaiting news about his son Absalom is a very moving mini-set piece that conveys an important dramatic point in David’s loving but deeply troubling relationship with this son. The play. In the book of second Samuel, chapter fourteen, you will find a carefully scripted one-act play, right down to the costume and make-up of the actor. It’s a piece of fiction, performed with such great skill before King David that it changes the king’s mind about a very sensitive family matter. What I find remarkable is the name of the playwright. It was written and directed by Joab, King David’s top military general. Allegory. This art form works metaphorically. A word, image, or phrase about one person or object is used in place of another to suggest an analogy. The Pilgrims Progress may be the most well known modern example. Augustine, the famous fourth-fifth century North African scholar, expounded Jesus’ Parable of the Good Samaritan allegorically. In Scripture, the dreams of Joseph, and Pharaoh’s dreams, later on in the Joseph narrative, work allegorically and need interpreting. There are a couple allegories in the book of Ezekiel, and the Bible’s apocalyptic literature is typically allegorical. Poetry. Hebrew poetry in Scripture is not unlike poetry today, with its uses of imagery, language (not unlike allegory), and rhythms, all variously and deliberately chosen and arranged, in hopes of creating for the reader or listener specific kinds of responses. The Hebrew poetry in Scripture is not like much poetry today in that writers of the former offer what life is like in covenant relation with Yahweh. Also, poets typically want you, the reader or listener, to get what you can from a poem, almost as an “each to his or her own” interpretation. This can disturb the literalists among us. The genius of the poetic ambiguity, however, is that a good poem with its universal imagery speaks beyond its time and to any culture. The Psalms of Scripture, for instance, written 2,500 years ago, still speak to people around the world today. Anyone who thinks Scripture is boring or dated would do well to find a good book that discusses Psalms as the poetry. The proverb. We may not immediately think of proverbs as an art form, but just try to write a pithy saying, such as a maxim, epigram, or adage – intentionally brief in length, compact in meaning, easily intelligible to their audience, memorable – and you’ll discover how difficult it is to do that. The parable. The same thing is true about parables – very difficult to invent. In Scripture it is clear that Jesus was a master story-teller, which is the basis of a good parable. And as are most other art forms, parables are also invitational. You’re being invited into an imaginary world, to see and experience what’s going on there. It’s a world where you can make what we might call cost-free decisions about what’s going on, because you’re not directly involved. And of course you can refuse the invitation. As storytelling, a parable works by inviting the hearer into a hypothetical world where the outward appearances are different but the rules for making the decisions or judgments are the same as in the “real” world. So you are a Jewish religious leader listening to Jesus and you hear the story of a wounded man lying by the roadside, and only one person out of three bothers to look after him. You’re surprised at that, and you are drawn into the situation and begin to make relatively unbiased judgments about it because you are not the person directly involved. You don’t have to do anything about it in your own “real” world. I’ll close with this final thought. 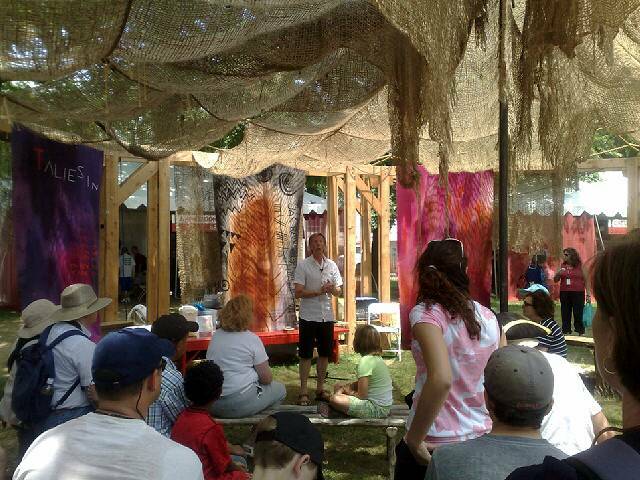 Art in Scripture is meant to initiate people into what experiences of life under God can be like. When it comes to Jesus, wisdom teacher par excellence, what separates his stories from run-of-the-mill is that they are about the counter-kingdom of the God’s in-coming kingdom and rule. Jesus means for there to be a dialogue going on about this between his audiences and his parables. 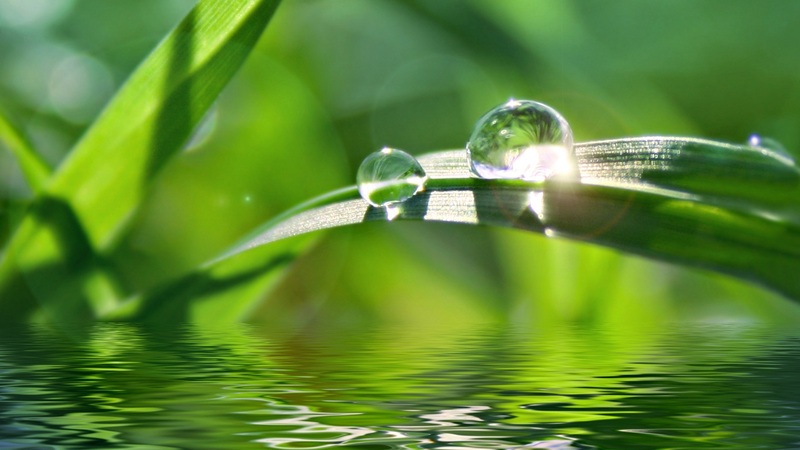 It is a dialogue meant to disorient, dislocate, us in hopes of reorienting, relocating, us to the in-breaking kingdom and rule of God and its effects on and in our lives. That is what makes his listeners, then and now, balk. Jesus radically challenges traditional, accepted, well-established ways thinking about life, decision making, and human relationships. And he employees all sorts for concrete and universal, everyday images to do this, such as business dealings, finances, treasures, seed time and harvest, family matters, and much more. He is using the things of everyday life deliberately, to show that nowhere along the spectrum of life will the in-breaking kingdom of God not effect radical changes in our thinking and doing. To those “with ears to hear and eyes to see,” Jesus is revealing the kingdom of God’s normative ways of living. The more we let the art of the Bible speak to us like this, the more discerning we will become of gospel-shaped principles of taste and judgment in art, of whatever kind and wherever we find it. 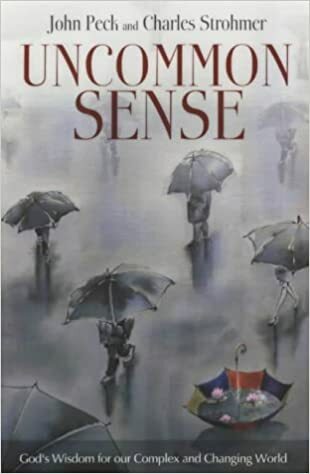 And the more that kind of seeing and hearing constitutes our spiritual DNA, the more intuitive it will become for us to immediately know to reject the countless invitations of art sent our way today to oppose and seek to invalidate God’s wisdom. Images via Creative Commons. 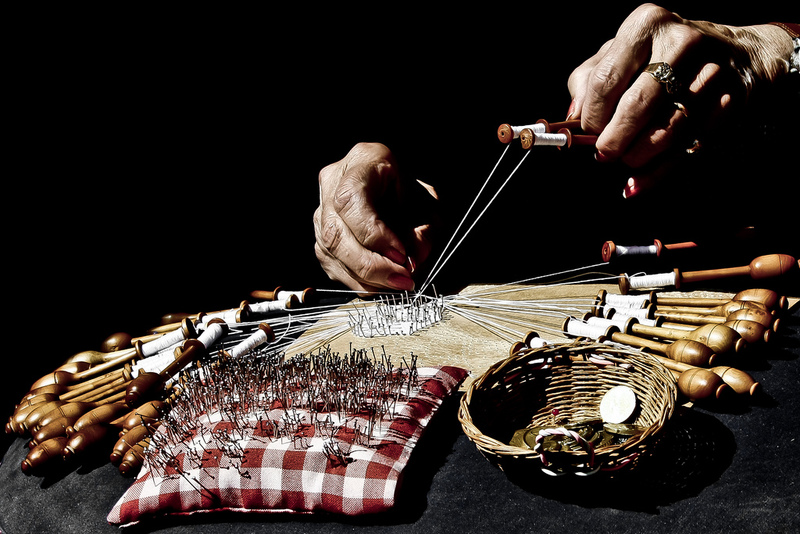 Seamstress hands, by Hernan Pinera. 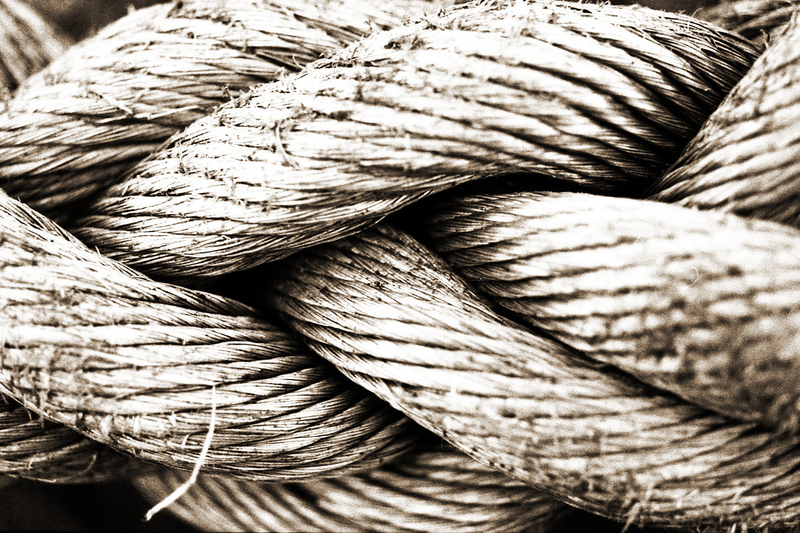 Knot, by crosslens. Storytelling, by Shashi Bellamonda. Well, okay, of course there’s an obvious difference, and a bunch of others we could also consider, but here I just want to underline the different attitude that Jesus and Eve had toward the devil’s temptations. Now the serpent was more crafty than any of the wild animals the Lord God had made. He said to the woman, “Did God really say, ‘You must not eat from any tree in the garden’?” The woman said to the serpent, “We may eat fruit from the trees in the garden, but God did say, ‘You must not eat fruit from the tree that is in the middle of the garden, and you must not touch it, or you will die.’” “You will not certainly die,” the serpent said to the woman. For God knows that when you eat from it your eyes will be opened, and you will be like God, knowing good and evil.” (Genesis 3:1-5). It often goes unnoticed in these two narratives that Eve tries set the devil straight, correct his theology. But Jesus does not do that. Jesus rebukes the devil with God’s word. It’s a radical difference with different outcomes we ought to take to heart. But Jesus, our example, never goes there. Nor should we if the devil approaches. The different end result of each biblical narrative reveals why. In the one, the Lord God banishes Adam and Eve from the Garden of Eden; they are driven out (Genesis 3:23-24). In the other narrative, the devil leaves Jesus and angels come to attend to him (Matthew 4:11). The path to defeat or the path to victory. Eve often gets a bad rap in the story but, all things considered, I think she must have been an utterly amazing woman. The thing is, she was never cut out to dialogue with the devil. Perhaps, as we tend to do, she was relying on her own understanding. I don’t know. But that dialogue ended with her acting on a rationalization that it was okay to ignore God’s word. Jesus, however, whom I assume would have won any debate with the devil, nevertheless refused to debate with the devil and instead relied on God’s word. “God is faithful … when you are tempted, he will also provide a way out …” (1 Corinthians 10:13). Image by William Ward via Creative Commons permission. After a year of steady writing and then several unexpected publishing delays, I’m glad to say that Odd Man Out has now been published. You’ll find that its style is a departure from what you are used to reading from me. 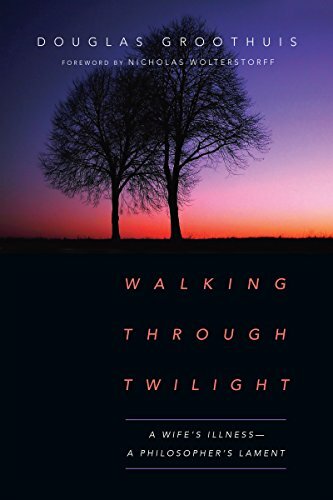 None of my previous books were autobiographical, nor are most of the articles I write, including what appears on this blog. Instead, Odd Man Out is a short, honest, true story of what was by far the strangest ten-year period of my life. It begins in Detroit, my hometown, in the late 1960s, when I had lost all faith in the American Dream. In its place, I turned to the spiritual values and interests of what was then called the Age of Aquarius, becoming one if its staunchest practitioners and preachers. That lifestyle sent me into strange places of the spirit, where I made major life-decisions that seemed sweet but turned so sour. I was often on the road those years, and by July, 1976, the month that Americans were partying big time, celebrating the nation’s bicentennial, I was living like a hermit in southern California and had only the flimsiest grip on reality. 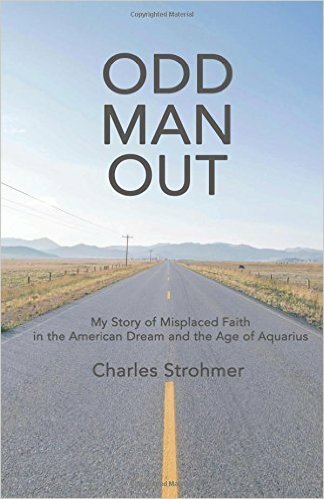 Odd Man Out recounts those years when I was an Aquarian dreamer and how that lifestyle eventually left me in bitter disappointment on the beaches of southern California where, to my complete shock, I found myself in the throes of a conversion that revolutionized my life. “It is the autumn of 1969. I now have six siblings, three brothers and three sisters, all younger, and my parents have recently moved the family to southern California. But there are two exceptions to the familial upheaval, myself and a sister; we continue living in Detroit. For several weeks following the big move, our gray brick house on Kinloch in Redford Township remains empty, and I still have my key to the place. One Saturday morning I meet a friend there. “Rick is helping me cart off what remains of my possessions to my new digs, a cheap but roomy four-bedroom flat on Telegraph Road in west Detroit. The empty house is strangely quiet. Rick and I are upstairs in my bedroom, a long rectangular space with wood floors that is now empty. Almost. “I find the car, thick with dust and cobwebs, stashed deep within the rafters behind a wall of the bedroom. I had forgotten all about it. I haul it out, along with other objects from my childhood, which, if memory serves, included a small wicker basket, a beat up old suitcase, and a shoe box containing kiddie Valentine cards, some baby photos, and whatnot. The heavy baseball bat I do remember. “What about this? Do you want to take it? Rick asks, shoving the car, which skids along the hardwood floor into the middle of the empty room. “Today, that large, scale model of a white 1953 Corvette roadster is a sought-after collector’s item, itself loaded with symbolic value of the American Dream. I had received it as a gift when I six or seven. The sleek white convertible with its red interior stretched about a foot-and-a-half long, from its big, toothy chrome grille to its two tiny round tail lights. At one time it had working headlights and other ‘real car’ features that made me the envy of childhood friends. “I wiped the dust from Corvette with a piece of old cloth and pondered its fate. Clearly it is the one thing of material value of mine that remains in the house. To see more about Odd Man Out, including the current Editorial Reviews, in the US, please go to this page on Amazon.com. In the UK and Europe, please see this page.